Who would ever imagine that electro-acoustic music could thrive in a place like Cuba? Not me! Alas, in the mid-20th century, Juan Blanco (1919-2008) became one of the earliest adopters of experimental music production in that small Caribbean island country, which surprisingly harbored quite a scene of avant garde painters, writers and composers who went on to put their stamp on the international stage. Not surprisingly, this scene coalesced into Sociedad Cultural Nuestro Tiempo, an actual group that was started and funded out of pocket by Blanco himself. After inventing the first sampling keyboard in 1942, a good two decades before that instrument came into popular use, Blanco got inspired by the musique concrete of Pierre Schaeffer and started composing electronic works in the early ’60s on some low-end tape decks that he ordered from Sears! As if that weren’t cool enough, Blanco then became the director of Instituto Cubana de Amistad con el Pueblo, where he staged concerts featuring artists ranging all the way from Luigi Nono to Pink Floyd! In the ’80s, after becoming “involved with multimedia performance, theater ballet, film and environmental sound pieces,” Blanco started the International Festival for Electroacoustic Music in Cuba, followed by the ’90s, when he began composing pieces on a NeXT computer. 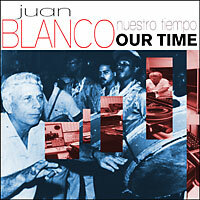 Collecting pieces from 1961-1993, the Nuestro Tiempo CD spans a full three decades, which formed just part of Blanco’s even longer and illustrious career. Collector scum may note that a few of these works previously appeared on LP on the Egrem label back in the ’70s and ’80s–very rare records which change hands for big bucks now. You are currently browsing the Arcane Candy weblog archives for December, 2013.